Today I have another polish from OPI's upcoming Euro Centrale Collection to share with you! I Saw... U Saw... We Saw... Warsaw* might just have the longest polish name ever! 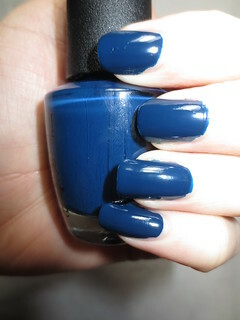 This polish is a beautiful deep navy shade, ideal for the cold Winter months. 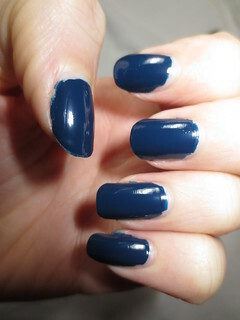 I'm a huge fan of deep navy polishes, and I Saw... U Saw... We Saw... Warsaw is no exception. What I love most about this polish was the formula, I almost got away with only one coat! This polish is so creamy and pigmented, it was so easy to apply. I made sure to use two coats of my base coat (OPI's Nail Envy Maintenance), to help ease the possible staining. When I removed this polish, my nails were slightly stained, but it wasn't too bad. True, I Saw... U Saw... We Saw... Warsaw might not be the most original polish out there, but I still do love it. A nice creme polish is a great change of pace for anyone who tends to gravitate towards shimmer and glitter polishes. Since the Euro Centrale Collection is being released as a Spring Collection, a deep navy is a bit of an odd inclusion. Never mind though, I think you can wear whatever shade you like, whenever you want to! I also think that I Saw... U Saw... We Saw... Warsaw would make an excellent base to apply a golden glitter polish over top of, either on all nails, or just as an accent nail. I must experiment with this! It's beautiful :) I think you'll like it! Hi, do you think it would look good on darker skin ?